Photo credit to Phil Javellana. Brazil, the world’s fifth-most populous country with over 203 million people, will vote in its general election on Sunday, October 5, with runoffs, as needed on Sunday, October 26. 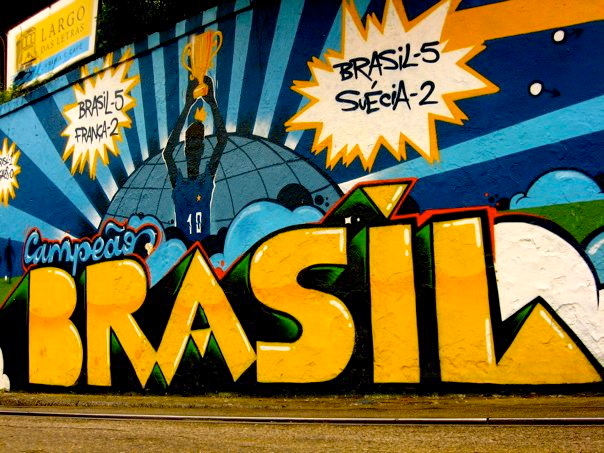 Brazilians will elect a president, governors in all 26 states and the Distrito Federal (Federal District), and many of the members of its Congresso Nacional (National Congress). Brazilians will elect all 513 members of the Câmara dos Deputados (Chamber of Deputies). Deputies are elected from each state on the basis of party-list proportional representation, with São Paulo getting 70 deputies and the smallest states just eight deputies. Brazilians will also elect 27 (one-third) of the 81 members of the Senado Federal (Federal Senate). Senators are elected to eight year-terms, with three members for each state on the first-past-the-post basis. The remaining two-thirds of the Senate will be elected in the next general election in 2018. 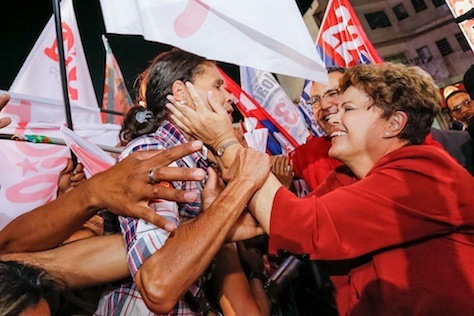 For the past 12 years, the center-left Partido dos Trabalhadores (PT, Workers Party) has governed Brazil, first under the two-term presidency of Luiz Inácio Lula da Silva, and since the October 2010 election, his former chief of staff and former energy minister Dilma Rousseff. Rousseff faced widespread protests in summer 2013 over the rising costs of public transportation, corruption and spending for the 2014 World Cup and 2016 Summer Olympics. Furthermore, she’s faced a slowing economy and the devaluation of the Brazilian currency, the real, over the past five years. Rousseff (pictured above) is now locked in a tough reelection against two challengers — senator and former Minas Gerais governor Aécio Neves and activist and former environmental minister Marina Silva. If no candidate wins an absolute majority of the vote, the top two vote-winners will advance to the October 26 runoff. 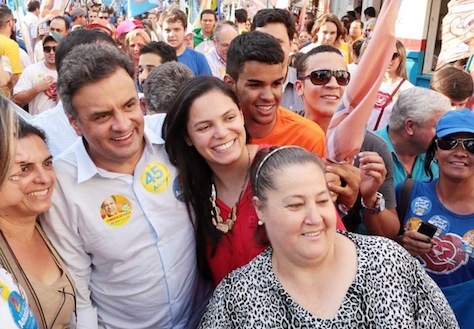 The latest Datafolha poll shows Rousseff with 40%, Silva with 25% and center-right challenger Aécio Neves with 20%. That’s a far different story than an August 28-29 survey that showed Rousseff and Silva tied at 34% each, with just 15% for Neves. That’s to be expected, perhaps, given that the sympathy for her party’s former candidate, Eduardo Campos, has subsided. Campos was killed in an airplane crash in early August. Rousseff also leads in the runoff by a 49% to 41% margin. Rousseff has improved her standing in the polls due to a wave of government standing, the full-throated support of Lula da Silva and the promise that only her reelection can guarantee the popular social welfare programs that the lutist governments of the 2000s introducing, including the Bolsa Familia that, in part, provides a cash handout to the poorest Brazilian families. Rousseff’s Workers Party currently has the largest number of seats in the Chamber of Deputies (20) the second-largest number in the Senate (12), and it holds the governorships of Acre, Bahia (the fourth-most populous state), Rio Grande do Sul (the fifth-most populous state), Sergipe and the Federal District. Rousseff, however, in alliance with several parties at the national level, the largest of which is the Partido do Movimento Democrático Brasileiro (PMDB, Brazilian Democratic Movement Party), which emerged out of the pro-democracy movement during the period of military rule between 1964 and 1985. Since the 1990s, the PMDB has supported the center-right government of former president Fernando Enrique Cardoso as well as the PT-led governments of Lula da Silva and Rousseff. Today, it’s a big-tent party whose chief ideological core seems to be remaining in power. It has the largest number of seats in the Senate (20), the second-largest in the Chamber of Deputies (78), and it currently holds the governorships of five states: Maranhão, Mato Grosso, Mato Grosso do Sul, Rondônia and Rio de Janeiro (the third-most populous state). Though most parties in Brazil are nominally center-left or center-right, they are typically more opportunistic than principled. That makes it easier to understand why so many ‘conservative’ parties are party of Rousseff’s government and supporting her for reelection, why Brazil’s ‘democratic labor’ party is supporting Neves, and why Silva, the candidate of the Brazilian Socialist Party, is running to Rousseff’s right on both social and economic policy. Partido Social Democrático (PSD, Social Democratic Party), not to be confused with the PSDB, is a new party formed in 2011 by former São Paulo mayor Gilberto Kassab, which includes figures from both the right and the left, and currently holds 48 members in the Chamber of Deputies, two senators and governorships in two states, Amazonas and Santa Catarina. Partido Progressista (PP, Progressive Party), a nominally conservative party that, like the PMDB, supported Cardoso as well as Lula da Silva and Rousseff, with 29 deputies and five senators. Partido da República (PR, Party of the Republic), another nominally conservtive party established in 2006 by the merger of two right-wing parties, that currently holds 35 deputies and five senators. Partido Democrático Trabalhista (PDT, Democratic Labour Party), a center-left party formed in 1979 in opposition to the military dictatorship, and an early competitor to Lula Da Silva’s PT under its former leader, the late Leonel Brizola. It currently has 25 deputies and five senators. Partido Comunista do Brasil (PCdoB, Communist Party of Brazil), the largest communist party in Brazil, which split from what’s the current Brazilian Communist Party (PCB) in 1962. It has 13 deputies and two senators, and it has supported Lula da Silva since 2002, though its leaders have often criticized the more neoliberal aspects of the government’s policies. Partido Republicano Brasileiro (PRB, Brazilian Republican Party), a Christian democratic party founded in 2005, has 10 deputies and one senator. Neves (pictured above) is the former governor of Minas Gerais, where he is generally acknowledged to have improved its poor financial condition, while also maintaining spending on crime, education and health care. The grandson of former democracy activist Tancredo Neves (who died in 1985 as the first post-military president-elect of Brazil), Neves is the candidate of the Partido da Social Democracia Brasileira (PSDB, Brazilian Social Democracy Party). The PSDB, popularly known as the ‘tucanos‘ (toucans), last held office when Cardoso was president between 1994 and 2002. It’s the largest opposition party in Brazil with 51 deputies, 12 senators and eight governorships, including Alagoas, Goiás, Pará, Paraná, Roraima and Tocantins. In São Paulo, Brazil’s most populous state, Geraldo Alckmin is set to win reelection easily. 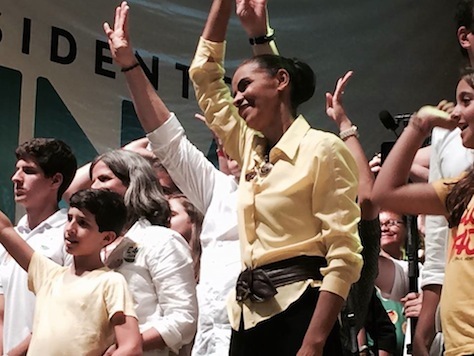 In Neves’s own Minas Gerais, however, the Workers Party is likely to recapture power. Democratas (DEM, Democrats), are the largest truly center-right party in Brazil, founded in 1985 by dissidents who opposed the policies of the military regime and supported free market liberalism. The party has 28 deputies, four senators and it controls the governorship of Rio Grande do Norte. Partido Democrático Trabalhista (PDT, Democratic Labour Party), a nominally center-left party founded in 1981 that tries to claim roots in the labor movement of Getúlio Vargas, who dominated Brazilian politics in the 1940s and 1950s. It has 19 deputies and six senators. Silva (pictured above) only recently joined the Brazilian Socialist Party, which until earlier this year was a longtime supporter of the Rousseff government and the Lula da Silva government before it. Campos, the former governor of Pernambuco state, developed a reputation as a relatively business-friendly official, and Silva has generally campaigned on a centrist, business-friendly platform as his replacement on the presidential ticket. The party has 32 deputies, four senators and currently holds six governorships: Amapá, Ceará, Espírito Santo, Paraíba, Piauí and Campos’s own Pernambuco. Who is Roberto Azevêdo — and does he matter?